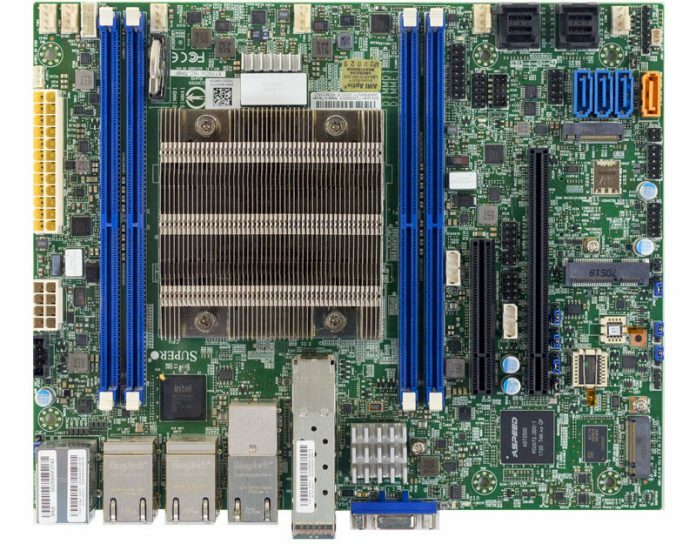 Our Supermicro X11SDV-16C-TP8F review should have a rating from some ratings body. If you are a server person (and if you are reading this, you probably are) what you are about to see is perhaps the ultimate embodiment of the current Intel Xeon D-2100 platform. 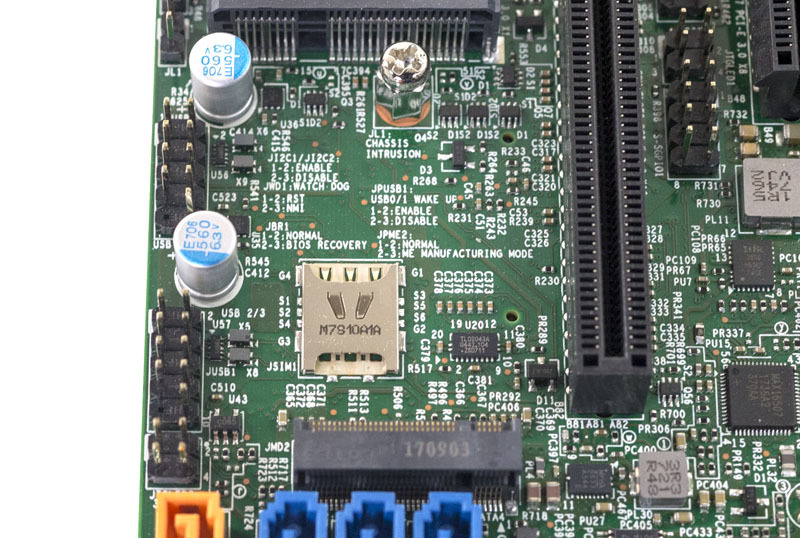 While this is an embedded product, it is also fair to say that this compact single CPU embedded platform can replace a large portion of the dual socket Intel Xeon E5-2600 V1 and some of the E5-2600 V2 market. It is simply that powerful. 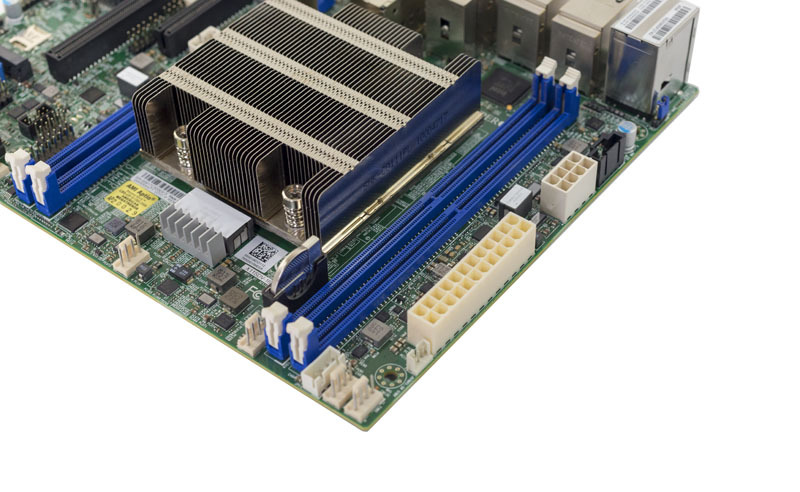 While we are going to review the Supermicro X11SDV-16C-TP8F platform as an embedded platform, but the capabilities for such a compact form factor are almost mind-blowing. At STH, we have had leading coverage of the Intel Xeon D market for several years. We have tested everything from the 2-core Intel Pentium D1508 (Broadwell-DE) to the 16-core Intel Xeon D-1587. 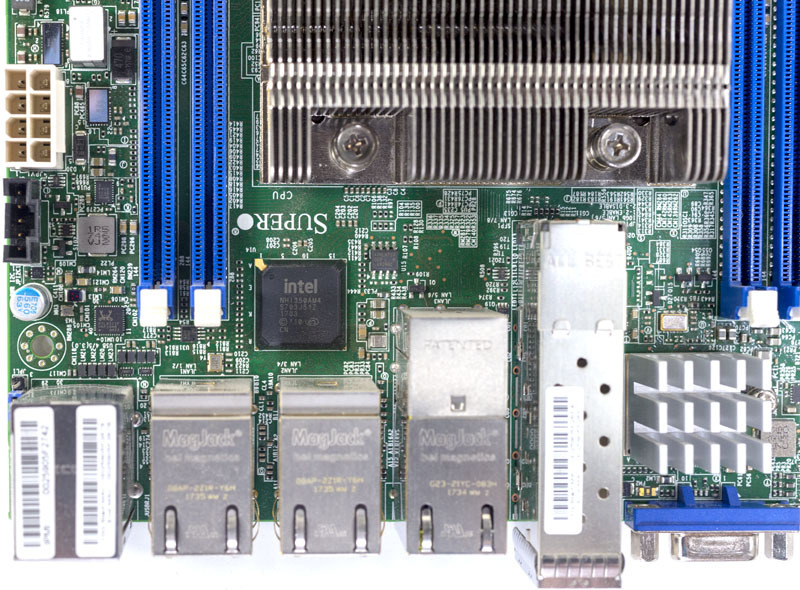 The first time we reviewed a 16-core Xeon D platform, the Supermicro X10SDV-7TP8F we saw a lot of potential, but there was a clear bottleneck: memory bandwidth. In this generation, that bottleneck is gone and instead, we have a better-balanced system with more capabilities. If you need a primer before we begin on the new Intel Xeon D platform, we have our Exploring Intel Xeon D Evolution from Xeon D-1500 to Xeon D-2100 piece which discusses many of the platform-level features of the two current generation Xeon D families. Let us get on with the review. At its most basic form, the Supermicro X11SDV-16C-TP8F is a FlexATX motherboard. 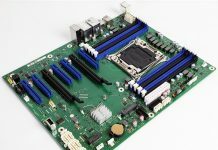 That means it fits in the same 9″ x 7.25″ form factor that we have seen for a few generations of Supermicro embedded products now, but it is less common elsewhere. 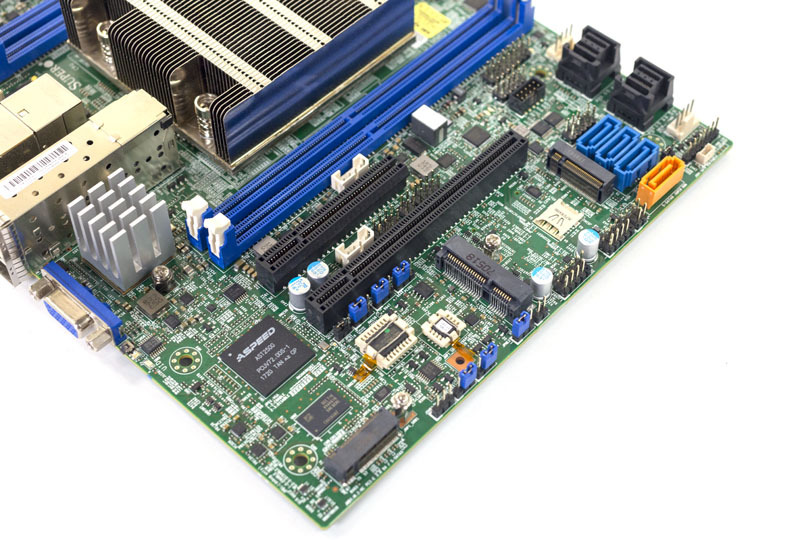 This form factor allows for about 45% more PCB area than a 6.7″ x 6.7″ mITX motherboard. At the same time, it is compact enough to fit into a short depth rackmount chassis with an array of cooling fans. Frankly, the Intel Xeon D-2100 series has so much to offer that it almost needs FlexATX or larger PCB space. The two biggest users of PCB space are the DDR4 DIMM slots and the CPU with cooling. The four DDR4 DIMM slots can support up to 4x 128GB LRDIMMs for up to 512GB of RAM capacity. That is in line with, or more than many 16 core servers are deployed with even if using two 8 core CPUs. That is also a 4x increase in capacity over previous generation D-1587 platforms. Another major difference is that this generation is using quad DDR4-2400 memory channels so one alleviates the RAM bandwidth bottleneck of the previous generation platform by more then doubling memory bandwidth. The CPU is the Intel Xeon D-2183IT which is a 16 core, 32 thread SoC. Facebook has an 18 core version of this chip without 10GbE, but if you want 10GbE and are not a hyperscaler, this is essentially the top of the line. The Intel Xeon D-2183IT core structure has the same 1MB of L2 cache per core and now 22MB of L3 cache shared among the 16 cores. That works out to 1.375MB of L3 cache per core. L2+L3 is 2.375MB per core. Clock speeds are up as well. With the Xeon D-1587 to D-2183IT jump base clocks are up from 1.7GHz to 2.2GHz. Turbo clocks are up from 2.3GHz to 3.0GHz in the new generation. This is a massive jump for embedded parts. That puts the Intel Xeon D-2183IT well above the entire Intel Xeon Silver 4100 range in terms of performance and out of reach of many Xeon Gold 5100 series CPUs as well. Corresponding to this massive jump is a TDP jump from 65W to 100W. There are both 8-pin and 24-pin ATX power connectors. One feature our readers may notice is that there are six 4-pin PWM fan headers onboard. That allows one to use chassis cooling fans for redundancy. Chassis cooling is required as this is a 100W SoC with a massive (for embedded) heatsink that needs to be cooled. 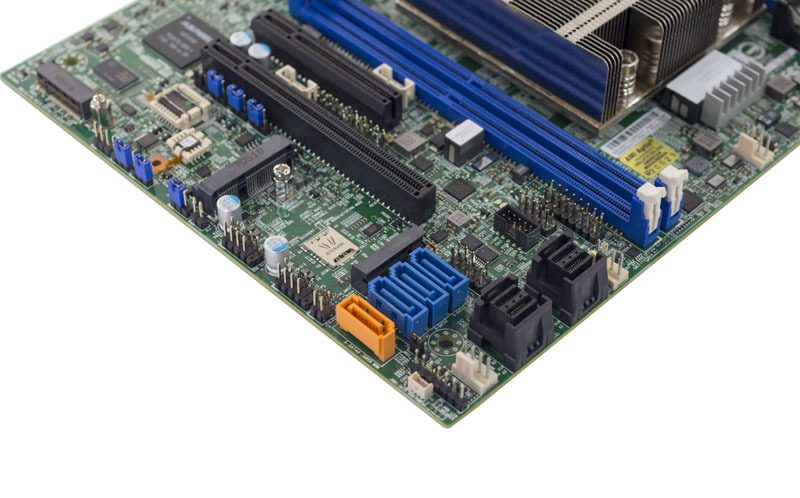 PCIe 3.0 lanes are up to 32 in this generation and Supermicro offers two traditional PCIe slots. One is a PCIe 3.0 x8 and the other is a PCIe 3.0 x16 slot. The x8 slot is open-ended in the event you have a need to use a x16 physical card or riser in the x8 physical slot. There are two M.2 slots that are M.2 2242/2280 or 42mm and 80mm sizes. These are PCIe x2/ SATA and PCIe x4 slots. One item you will notice that was present in previous generation products but is not here is an internal USB header. This motherboard is already packed and we understand the decision. There are at least four headers where one can put a higher reliability internally powered SATA or PCIe flash device so this makes a lot of sense. At this point, you have probably seen two items not on Supermicro’s product page at the time of this writing. The first is that there is a mPCIe/ mSATA header that is not listed on the product page, but it is there along with two retention points. This is a PCIe 3.0 x1 slot intended primarily for wireless WAN cards. This works in conjunction with the other feature not on the spec page that is the JSIM1 header which is a nano-SIM card header. We sent a note asking for formal confirmation from the Supermicro PM team during our final edits of this piece and will update with confirmation as it is available. The rear I/O is, plentiful. Let us start with legacy I/O. There are two USB 3.0 ports and a VGA port for KVM carts and on-prem maintenance. If you need to use a USB key, this is where it would go. The single RJ-45 port on the left is the IPMI management interface for out of band management. We will talk about Supermicro’s management solution after the hardware overview. On the networking side, there is a lot. There are four 10GbE ports, two SFP+ cages (right) and to the left of those cages are two 10Gbase-T ports. The other four ports use a higher-end controller, the Intel I350AM4 for 4x 1GbE connectivity. This is a higher-end 1GbE solution and is a premium offering compared to the Intel i210 series. You can see the Intel I350AM4 chip just behind the 1GbE ports. In terms of driver support, there are essentially four Intel igb supported 1GbE NICs. The 10GbE NICs are supported via the Intel i40e driver shared with Intel’s 700 series NICs. Next, we are going to look at the Supermicro IPMI management solution and the overall hardware topology. We will then discuss performance, power consumption and give our final thoughts. The real question, as is always, is when can we get our hands on these beauties. Over the years I’ve lost track of the number of great SKUs we’ve seen reviewed here that never seem to hit the retail channel. John S. – it should be soon from what we are hearing. The bigger constraint is that very little server gear (relatively) is sold through traditional retail. It is good to have a sales rep instead of simply looking on Amazon or Newegg. Is there any reason why Super Micro didn’t do 8 DIMM / 2DIMM per Channel? It should be cheaper on Memory Cost. I wish Intel could have allowed 1TB Memory Support, perfect for In-Memory caching server. Ed – you would have to ask them. From the PCB, it looks like they would not have fit FlexATX if they added four more DIMM slots and the additional wires for more RAM slots. @Patrick did you hear back from Supermicro about JSIM1 slot and WAN card support ? That is what it is for. I believe I answered this in the forums as well.